Willard Austen started his career in Cornell Library services while still an undergraduate, becoming a page in 1888. The year after he graduated in 1891, he was appointed as Assistant Librarian. Initially, the library had been seen as primarily a reference collection, but in 1908, the privilege of checking out the library’s books for home use was extended to all undergraduate students. Since Austen was in charge of reference and circulation, it fell to him to implement this controversial change. He created a system to register borrowers and to record loans. This method promoted responsible library use by ensuring that books taken out of the library would not be lost. Austen also served the library in other areas. He gave a regular course of lectures each year on the use of books, with instruction in practical work. Because of his experience as a printer, he also added resources to the library in the field of typography. In 1915, Austen succeeded George William Harris as Cornell’s third University Librarian. In this capacity he continued the collecting effort begun by his predecessors. 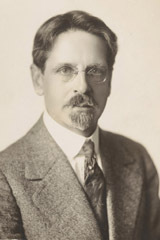 The Wason Collection on China and the Chinese, a collection of works in English relating to China, came in 1918, the bequest of alumnus Charles W. Wason. Today, this valuable collection is part of the East Asia collections, housed in the Carl A. Kroch Library. In 1923, the Benno Loewy collection, including law books, rare books, theater books and manuscripts, and a collection of Masonic literature, arrived at the university in four railroad boxcars. In 1925, trustee Victor Emanuel purchased the Wordsworth Collection, belonging to Cynthia Morgan St. John of Ithaca, for the library. By 1924, the Library held 710,000 books and was ranked fourth among American university libraries. Willard Austen retired in 1930, after a career in library services spanning more than forty years.